Regardless of where I’ve travelled in the world, I’ve found people to be self-centered and opinionated. I find this is especially true whenever I look in the mirror. Because of this selfishness our opinions generally begin in a place that considers our own viewpoint first and most important. The more mature we are the more often our opinions become informed by perspectives outside our own frame of reference. It’s quite rare that a self-centered opinion isn’t offensive, often because human beings like to be taken into consideration when opinions are being formed and expressed… even if they don’t often take others into consideration themselves. All of this self-focus places us into circumstances where personal opinions compete for the attention of an audience of people; sometimes in just a room full of people, other times in front of an entire nation. Because no one can perfectly share our perspective, or our self-regard, going through life without getting offended is impossible. As Christians, our job is to have a godly response in those moments when someone says, or does, something that we don’t like or agree with. 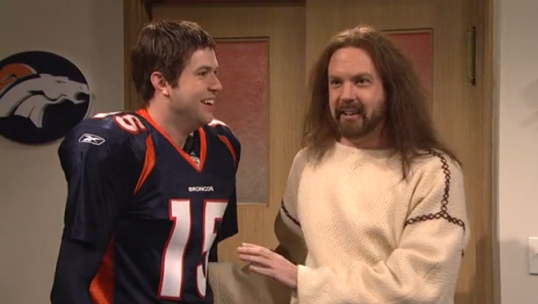 This weekend the cast of Saturday Night live expressed their opinions about “Tebowmania” in a sketch that featured Jesus Christ making a post-game appearance to the Broncos in their locker room. While taking credit for the Bronco victory and inferring that Bill Belicheck was the devil, Jesus took some time out to tell Tebow to “tone it down” and add “studying the playbook” to “studying the good book”. There were plenty of funny moments. 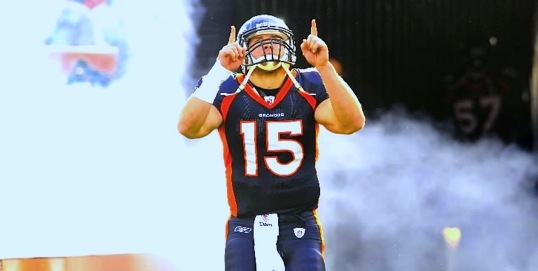 This weekend the legend of Tim Tebow will explode. Depending on the final score of this weekend’s marquee matchup with Tom Brady and the New England Patriots, it will either continue to swallow up small planets, or shatter into a million pieces. If it feels like Tebow-Mania can’t possibly get any bigger, imagine what will happen if his Broncos defeat Bill Belichick’s evil empire? Now imagine what it would be like if he threw for 300 yards and 3 touchdowns in the process. And that’s only what might happen ON the field. On the field this season Tebow, a remarkably good athlete and competitor, has taken over as the Broncos starting Quarterback and led his team to more unbelievable come-from-behind successes than MacGyver- despite being the worst football player on the field for the overwhelming majority of the game. Because the victories haven’t come as the result of remarkable overall play or even a demonstration of mastery over the most basic skills (like taking the ball from the center) the speculation of what makes him successful has become almost ridiculous. His success has been labelled “magical”, “miraculous”, “unprecedented”, and “mystical”. As his legend grows the experts, as well as the casual fans, have been left consistently wondering the same thing; “How does he do it?”, “How does he win all those games.” The answer is surprisingly easy. There are enough Evangelical Christian boycotts and protestations that it’s often easier to point out what we don’t believe in that what we do. When you consider the number of things that we’re supposed to get bent out shape over you begin to understand why many of us never read our Bibles, pray, or even evangelize. 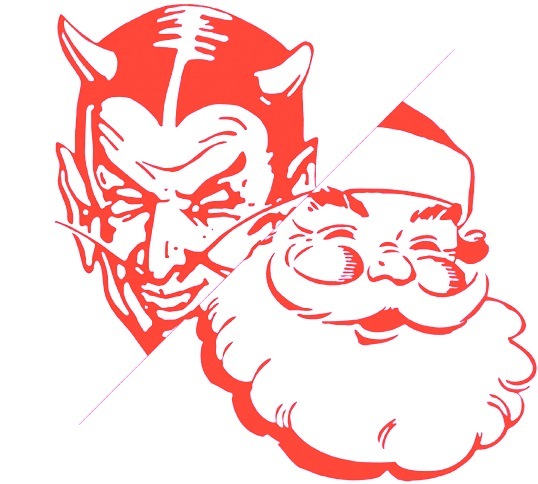 While Christians are on record for opposing: Hallmark, Halloween, Harry Potter, The Home Depot, Disney, Sony, and more, it’s hard to find a topic more divisive to many Christians than “Satan Claus”. #1. Santa Claus undercuts the true meaning of Christmas, robbing Jesus of his rightful glory and promoting consumerism. #2. Lying is wrong. I’m not going to teach my kid to lie, by lying about Santa. #3. I’m not letting some “fat idiot” take credit for presents that I bought. These beliefs, or some combination of them, often lead to a bitter refusal to participate in the “Santa myth” and the accompanying 2 months of griping when velvet, beards, and heavy-set men are spotted near twinkle lighting. I’d like to just take a holiday moment to say to the garden-variety Christian that “you don’t have to hate Santa” . I’ll do this by addressing the three main reasons… in a tongue in cheek fashion.